This week, we’re going to start at the beginning, literally. 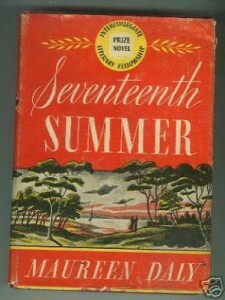 First published in 1942 and continuously in print ever since, Maureen Daly’s Seventeenth Summer is widely credited with being the very first work of YA Fiction, the genre that would go on to spawn a gazillion age-inappropriate romances, would-be Olympic Ice Dancers and the Wakefield Twins. So, pretty much Saved By The Bell: The Novel. The Plot: 17 year old Angie Morrow has just graduated from an all-girls prep school in the medium-sized town of Fond du Lac, Wisconsin when she suddenly attracts the notice of Jack Duluth, who has also just graduated from the local public high school. Angie has lead a relatively sheltered life with her 3 sisters (two older, one younger), her strict mother and largely-absent father (a traveling salesman who is only home on the weekends). The family dynamic is much more interesting than the love story (which is largely the same, plot-wise as Beverly Cleary’s Fifteen, but lacking Cleary’s deft sense of humor). Angie’s eldest sister, Margaret, is in her twenties and lives at home while working full time at an unspecified job and is engaged to Art, a sensitive, doughy fellow from Milwaukee. The next-oldest, Lorraine, has just finished her sophomore year at a women’s college in Chicago and is home for the summer and working at a bulk mailing house. It is Lorraine who is surprisingly the source of most of the plot’s angst. Finally, 10 year old Kitty is the youngest, a well-behaved tomboy. The strangeness of the story lurking behind that early 1990s cover art (my copy only has the 1942 copyright and the 1968 paperback publication date, so I’m unclear on when those hideous orange-and-pink-and-blue graphics got stuck on the cover) partially has to do with the cultural references (in the very first chapter narrator Angie goes on about “morning radio serials”) but more to do with morality that the characters adhere to and accept as normal. And trust me, to the modern reader that morality is WEIRD AND CONTRADICTORY! The most jarring points are the amount of casual smoking and drinking done by the teenage characters: Jack takes Angie to a bar on their first date, which is a perfectly normal place for two 17 year olds to go in Wisconsin in 1942! I guess? I don’t know! On one hand they are both high school graduates, so the world treats them like adults… on the other both Jack and Angie’s family treat them and their older siblings like children, imposing curfews, vetoing their dates and generally planning their lives. Even Margaret, who is in her 20s, working and engaged to be married, accepts this arrangement unquestioningly. Then again, at a kegger thrown at Jack’s summer cottage, one of the girls declares that she is glad they got beer because “after last night I couldn’t stand to look another mixed drink in the face!” That worldliness comes out of the mouth of a 15-year old. And being the 1940s everyone (except Angie’s parents) is chain smoking, and Jack enjoys smoking a pipe, especially when he is out on his sailboat. The B-plot focuses on Lorraine and her trouble adjusting to being back at home for the summer after being away at college. It’s clear that Lorraine wasn’t as socially successful as her sisters in Fond du Lac, although she seems to be a hit with the boys in Chicago. For reasons Angie never fully understands, she attaches herself to Martin, a slightly older man who has been recently transferred to Fond du Lac by his insurance company employer. Angie and Margaret believe that it is because he’s new in town and therefore one of the only men who dosen’t remember what a drip Lorraine was in school. Unfortunately, Martin is, in the current vernacular, a huge douchebag. He strings Lorraine along all summer, showing up for dates when he can’t find any other girls to go out with him, not calling for weeks and generally sowing discord between Lorraine and her family. Lorraine tries desperately to confide in younger sister, but what is going on is beyond Angie’s understanding. When Martin stands Lorraine up for a date on his birthday, she petulantly picks off the gilt initials from the wallet she had purchased for him. Martin is never heard from again, and Lorraine decides to go back to Chicago early: it is implied that she had “gone all the way” with him before he ditched her. Surely she will be better off in the big city! This entry was posted in Vintage YA Fiction and tagged 1942, Author D, Romance, Title S. Bookmark the permalink. Oh! Wonderful review. No! Peachy-keen! I stumbled upon your blog looking for the cover of the original, and will link to this review when my post is up on 7/20/2013. Now I’m off to see what other gems you have here. As an ardent follower of Lenora Mattingly Weber and Rosamund du Jardin, you may just be my new favorite blogger! Aw, thanks, I really appreciate the kind words and the linking! I really look forward to reading your post! On the sailboat! They go under the tarp to light his pipe out of the wind! And when they emerge other dude leers at them! And she thinks something like, “We might just as well been doing what he thought (necking? petting? )” reflecting on the fragility of a girl’s reputation. 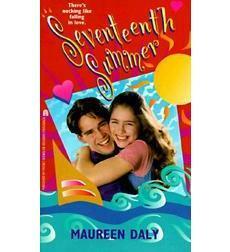 Also, wasn’t there a Betty Cavana book where the girl reads Seventeenth Summer and is so taken by Daly’s genuine style that she rewrites her entry for the essay contest, and then accidentally submits the Daly-style rewrite and wins? Betty giving Maureen a shout-out. But when I was reading the Scholastic re-release (probably re-titled, they loved to do that) of the Cavana, 17th Summer was out of print. Consulting The Google, the book is A Girl Can Dream (Scholastic called it Girls Can Dream, Too. SO much better.) The contest is for flying lessons. And someone refers to her reading Wind Sand and Stars, which makes more sense as inspiration for the essay. Could have read Antoine de Saint-Exupéry and Maureen Daly both? Or, could have been some other book entirely. So many, so long ago. I know, they can all run together sometimes! Thanks for the info, I’m going to have to keep an eye out for it! I loved this book so much that I intentionally kept it and paid the library lost book penalty back in 1978. Still have it (alling apart now) with two feathered-hair 70s teens on the cover. I just read it again and have to say its finally starting to show its age. Angie was really kind of a jerk. I was horrified at her description of Jack’s friend Fitz: “He had a very bad complexion and a shiftiness about him, as if by not looking directly at me he could avoid my looking at him and seeing his ugly skin”. Although I did get a kick out of her feeling depressed because she didn’t look cool wagging her finger and clicking her tongue as she swayed in beat with what I realize now must have been Benny Goodman band music. My mom (of Ms. Daly’s generation) used to do that when she heard the old timey big band music. I was crushed at their parting when I was young, now I hope that Jack met a nice girl in OK and became a gazillionaire when he created Hostess Bakery and left Angie in the dusk. Top sheet indeed, what a snob. Angie didn’t deserve him and his soft Mercury-astro buzz cut and wild grape-stained lips. To me it seemed like the biggest “tell” that the story was written (or at least conceived by) an actual teenager was how unself-consciously judgmental Angie is! This week: from the archives! This book is the reason that I had to visit Fond du Lac recently on one of our Milwaukee, Wisconsin trips. I love this book. That is so cool! Hmmm, maybe we should coordinate road trips to towns featured in classic girls fiction for a blog feature… I know you guys are up for the “Little House” sites! Towards the end, Angie looks around Pete’s, the roadhouse where they hang out, and thinks how sad it is that, except for the few, like her, who are going to college, most of the regulars will continue to be regulars for years. Until they get married and have kids of their own, and someday it’ll be those kids hanging out. Except, not quite. When Daly wrote this, the U.S. hadn’t gotten into the war yet. If Angie and the others had been real, the next time she’d seen these guys, they would be in uniform, and some she would never see again. (Really, it only took a year for that passage to become outdated.) Beyond that, Pete’s was on borrowed time, being a total firetrap. And even if it didn’t burn down, the next generation, like her younger sister, would not choose a shabby roadhouse as their hangout. That would be a drive-in. She’s got the basic point right: some people move on and some don’t. But The War ™ changed a great many things. I got this book in my jr high library & read this & loved it. My mother also read it as a young teen & loved it as well. My daughter didn’t know what the big deal was!!! Did the afternoon radio soaps not translate, LOL? Thanks for commenting! I grew up in a small town near Fond du Lac — it was the nearest, larger town for shopping so we went there frequently. I read “Seventeenth Summer” as a teenager in the late ’50s and was so entranced by the story and fact it was set in a familiar area. Now living in Southern California, one day I was surprised to find a copy of the book at a newspaper I worked at! I recently recommended it to my granddaughter, but at 10, she is a little too young, and the story is a little dated for her interest. I remember feeling somewhat put off by Angie’s feelings of superiority to Jack. I wanted her to tell him she loved him and for them to end up together.